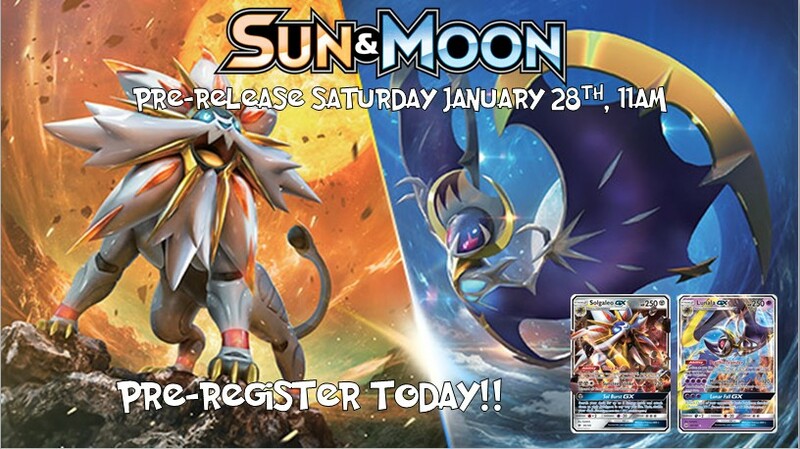 Join us for the exciting Pre-Release of Pokemon Sun and Moon on Saturday January 28th. Registration begins at 10:00AM and the event will begin at 11:00AM. The cost to enter is $25. Each player will receive a Sun and Moon pre-release kit containing 4 booster packs of Pokemon Sun and Moon, a Promo card, and a special Evolution pack. At the completion of the event, each player will receive an additional 3 Sun and Moon booster packs. Sun and Moon will be a very popular set. Pre-registration is strongly recommended to secure your spot. You can pre-register online at https://the-relentless-dragon.myshopify.com/.